A blurb for Native American writer Leslie Marmon Silko’s 1991 epic Almanac of the Dead compares it favorably to Tolstoy’s War and Peace. Indeed, having recently read her earlier novel Ceremony, I had a similar thought as I encountered the richly told episode of a sacred eagle hunt – which at the time I compared favorably to the famous fox-hunting scene in Tolstoy’s epic. Certainly, unless there is a more recent work that I don’t know about, this more recent novel is her masterpiece. And perhaps its central virtue, at this strange and terrifying political season, is its stunning rhetorical power to show us the present world through the eyes of its most disaffected and marginalized people – indigenous peoples of all the Americas and an unlikely assortment of the similarly aggrieved: a single mom coming off of a cocaine addiction and searching for a lost child; homeless Vietnam veterans both black and white; cyber- and eco-terrorists; drug and arms smugglers; humanitarian Catholic smugglers of Latin American refugees from anti-indigenous wars to the sanctuary of El Norte; to name a few. This ability to see the world through the eyes of the Other – even that Other we find most obnoxious and, perhaps more to the point, threatening – is surely a vital skill in this time of competing absolutes and escalating (even apocalyptic) conflict; when, whether or not at the end of the day we share some of their perceptions, it might at least be helpful to know where they are coming from, to catch a glimpse of their humanity. The problem, otherwise, is that we are each always looking at the world through different lenses, informed by different prejudices and assumptions – and yes, even experiences – into intransigent and often violent and destructive postures of last resort. Consider in this context the Republican Presidential candidate’s suggestion that the whole Israeli-Palestinian problem (which I have discussed in earlier blogs) is essentially unresolvable, that instead of trying we may as well just take a spectator’s seat and see what happens. Likewise the tendency of the principals’ in that conflict – Israelis and Palestinians both – to in their opposed struggles, as Nietzsche aptly warns us, become the monsters that they wish to destroy. Even as we exceptionalist United-States Americans, in an effort to protect ourselves from terrorists, may indeed risk becoming – as in some eyes we already seem to be! – a terrorist nation ourselves. See it imaginatively from the eyes of the child maimed (all or most of his family killed) in a drone strike on a traditional Afghan wedding, as has happened. If it were any of our wedding, imagine the hell to pay! Yet I wonder in this respect if Governor Romney thinks it treasonous speech, a crime against our own exceptionalism, to apologize for even such an accident of war? Not that President Obama, given the astronomical increase during his Administration in the number of U.S. drone attacks, might not himself be culpable. But I digress. The focus here is on Silko’s novel, which as I commented possesses the not-always-appreciated virtue of showing exceptionalist America our world as perceived – rightly or wrongly or (more probably) a combination of the two – by the Other even among us. The brunt of the action in Almanac of the Dead takes place in our American Southwest, with Tucson at its center, and in northern and southern Mexico. At dead center are the characters of Lecha and her sister Zeta; in particular Lecha, who has been assigned (by their plain-spoken eccentric grandmother Yoeme) to the sorting out and electronic storage of the papers of an immense book – or “almanac” – of indigenous America, with its convoluted and partial layering of history of the dead and prophecy for the living, present and future. The Indian grandmother and these twins, who are now in their sixties, originate in the Mexican state of Sonora, and the sisters are ensconced on a heavily fortified ranch outside of Tucson – at the center of a smuggling ring that has recently, under the guidance of Zeta, tended away from the smuggling of cocaine toward the more reliable profit maker which is military arms and weaponry. But Lecha, who has just come home after a decades’-long career as a television psychic, is focused primarily on the almanac. 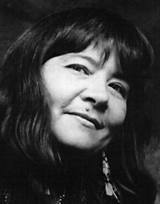 Which emerges over the course of Silko’s novel in fits and starts and fragments. Interspersed with all of this, and with a multitude of intense action that makes the novel quite a page turner, is a great deal of authentic history which reflects the years of intensive research that she put into the work. Particularly enlightening to me is the less than flattering view of the founding of Tucson, was built on the ill-gotten fruits of the long Apache Wars – directed at the legendary and in fact almost mythic figure of Geronimo. I came to a rich new understanding of the recent episode of the banning – by Tucson school authorities – of books from the Mexican American Studies program, which I also spoke of in an earlier blog; certainly a fair number of books exist – this one undoubtedly among them – that might seem threatening to an elite society built on a notion of white superiority (not to say “supremacy”), and that they would thus want to remain hidden: especially given continuous border tensions – and the fear of a migration of brown hordes from the South – that this novel brilliantly evokes. But to return to the problem of point of view, and our urgent need to perceive much more than our own perceptions: one of the most sympathetic characters in this novel, it might surprise some readers to know, is the reforming cocaine-addled mother who is jarred out of her self-destructive complacency by the kidnapping (not by anyone unknown to her, it might be added) of her little child. This character, named Seese (I am not sure how to properly pronounce it), is present in the novel from its first page to almost its last, where she is still alive but shattered by a series of violent events and the realization that she will never again see that child. The point I would make about her, though – and of other stereotyped “welfare” moms (though there is no indication that she ever received a dime from the State), the vital point, I think, is to know that she, as others like her, has a personal history that (while this might not excuse her choices) has led her to the place she is; and is not oblivious to the sordidness from which she now struggles (not at all un-heroically) to arise. This is something that I wish Governor Romney, who would stigmatize and disparage all Americans who presently struggle in their various ways, would give some thought to. It doesn’t appear that he has an accurate notion of what it’s like for people who struggle from day to day just to keep or find jobs; to keep their houses from foreclosing; to keep or acquire medical insurance; to send their kids to college; to go to college without drowning in debt for the privilege; to live a meaningful life and find a little tranquility before dying. Nor does it appear that he has considered that a person who plays by all the rules and takes personal responsibility and only takes what he has earned might somehow end up falling through ever widening cracks. Certainly not the likes of someone like Seese who might still, despite all her failings, have a right – granted by our nation’s wealth and by our supposed state of civilization – to at least shelter over her head and medical care. As for Leslie Marmon Silko’s wonderful book, it well deserves the designation of a Native American War and Peace and will likely resonate more powerfully to today’s readers. At 763 pages it is long (so are some extremely popular books by the likes of Stephen King and J.K. Rowling) but it reads well and for the most part swiftly. Not always a pleasant or consoling read, but almost always enlightening. And which does end – at least to those willing to take a long view and cry with the world’s multitude of fellow sufferers – on a hopeful note. Above all, to me, it is a powerful example of what Kenneth Burke calls literature’s rhetorical power to persuade to attitude. It teaches us, it is true, how not to live, but also how to live with dignity and a higher purpose. Even through the perspective of people (as if we all weren’t!) so richly and variously flawed.